Egret Pointe South is a North Myrtle Beach resort that is in a beautiful part of North Myrtle Beach, South Carolina. On the edge of the Cherry Grove Inlet and salt marsh sits this beautifully constructed North Myrtle Beach resort that is only three stories tall and features only three North Myrtle Beach vacation rentals per floor. Egret Pointe South is right off of Sea Mountain Highway and overlooks the tranquil salt marsh where you just might spy a regal egret wading in the water. Along with the serenity of the salt marsh, the Cherry Grove section of North Myrtle Beach, SC, in which you will find this North Myrtle Beach resort, is home to the very popular Cherry Grove Fishing Pier. Rent a kayak and paddle the inlet waters. Fish from the nearby pier. Swim in the ocean’s waves and admire the immense beauty found at the beach here. Egret Pointe South is a really nice North Myrtle Beach resort that is within walking distance of the white sandy beaches and Atlantic Ocean. This North Myrtle Beach resort is just a few blocks from the beach and it has nicely decorated two-bedroom North Myrtle Beach condos for your family to enjoy during a North Myrtle Beach vacation. These spacious two-bedroom, two-bath North Myrtle Beach condominium rentals sleep six people with two in each private bedroom and two more on the comfortable sleeper sofa in the living room. These accommodations are so welcoming and they really do include all the fabulous amenities of home. These ocean view condos in North Myrtle Beach, South Carolina feature a wonderfully furnished kitchen with updated appliances. Use the refrigerator to keep your soft drinks cold and take advantage of the stove top and oven to make a quick meal during your North Myrtle Beach vacation at Egret Pointe South. The breakfast bar is a simple locale for serving breakfast in the early morning hours of your North Myrtle Beach vacation days. There is even a dishwasher in these North Myrtle Beach condos’ kitchens. With these full-size appliances along with all the cookware, dishes and utensils that are provided for your family in these Egret Pointe South condos you can spend more time enjoying the pool, the beach and the attractions because life in your condo will be so easy. 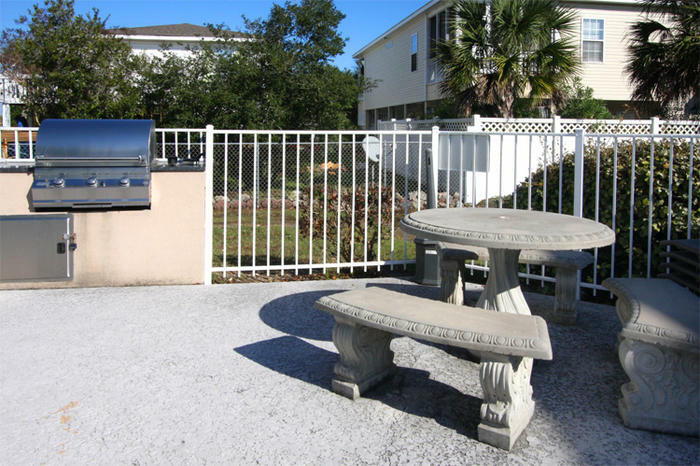 These North Myrtle Beach vacation rentals also boast a most convenient washing machine and clothes dryer for your use. These appliances are furnished in your North Myrtle Beach condo rental so you can do laundry as early in the morning or as late at night as best suits you.